If you received a letter from Blue Cross Blue Shield this week quoting individual insurance rates for 2015, it might be worth checking those numbers twice. About 42,000 BCBSNC individuals received letters this week containing incorrect amounts. In some cases, customers saw their costs increase more than 100 percent. Blue Cross is inviting customers to call customer service starting Friday to get their correct rate for next year. New rate letters are also on the way. About 38,000 customers will learn they received a rate that is too high. Roughly 4,000 customers will be notified that the rates they received were lower than what they should be. The average rate increase for individual customers next year is 13.4%, with many customers receiving subsidies. 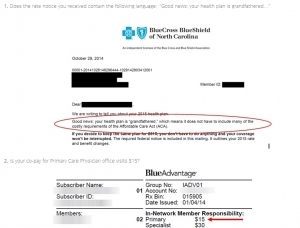 According to the insurer, this error affected only customers who are grandfathered and have a Blue Advantage health plan with a $15 co-pay for primary care office visits (Plan A). Again, customers are invited to call customer service starting today to check their rate quote.